As the sun shifts into “Uttarayan” (the Northern journey) today, I start with a healthy note of “Alsi ke laddu”. Flaxseeds (Alsi) are not only good in Omega-3 but also in lignans and fiber content. So starting this year with the wish of health and peace for everyone, I bring to you an easy recipe of these laddus. 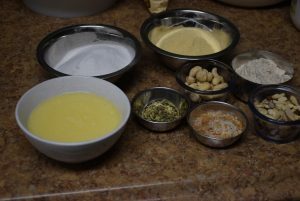 Laddu/laddoo(an Indian roundel sweet) usually contains ghee(clarified butter), flour and sugar as the main ingredients. 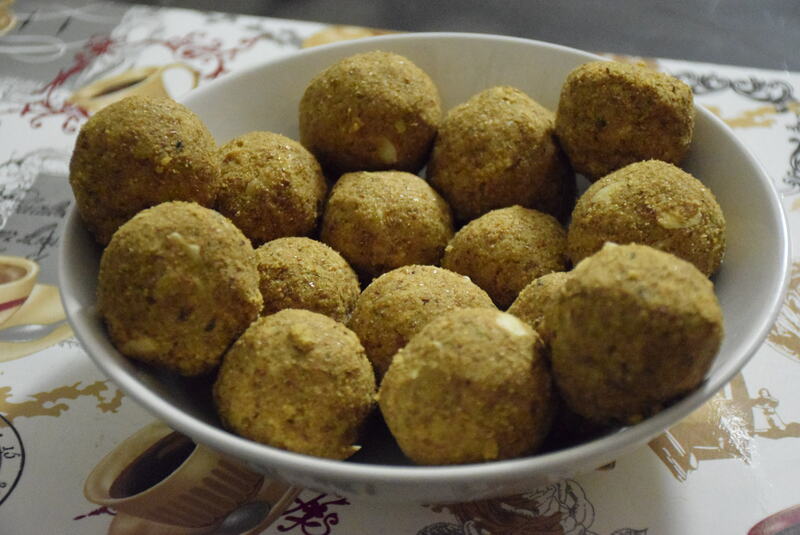 Here I am making these laddu using flaxseeds, but the same recipe can be used to make laddu using flaxseed flour/powder too. 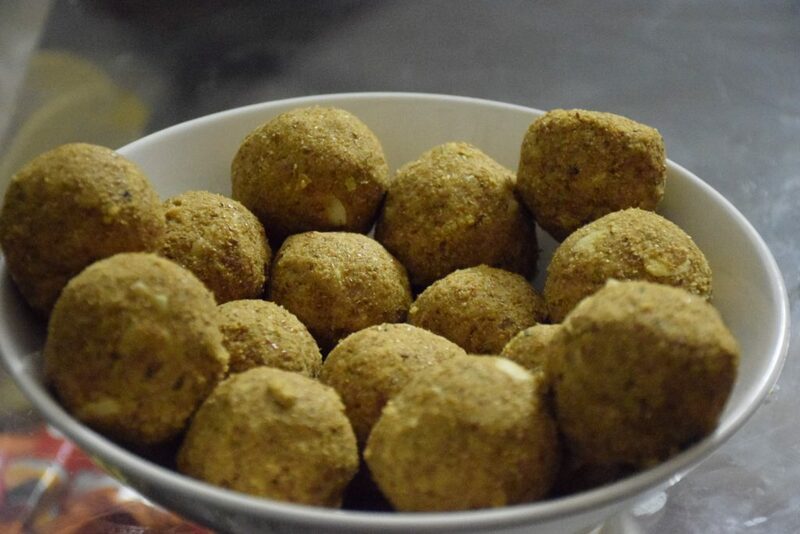 In winters, these laddoos help in revitalizing our bodies with essential nutrients and repairing the our worn-out tissues in muscles and bones. These definitely have a different taste than the atte ke or besan laddus with a strong flavor of flaxseeds. So it takes time to adapt to their taste. :). 1. 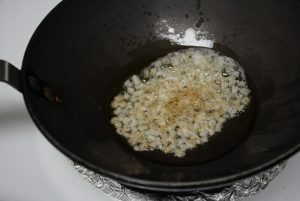 Take a wok, and add the Alsi seeds (flax seeds) to it. Dry roast them on medium heat for 4 to 5 mins. 2. 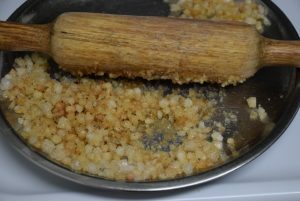 After a few mins, they will start crackling or popping like the mustard seeds (rai) and sputter . Stir them continously and lower the heat. You will notice they had puffed up little in size. 3. Take them off the heat and transfer them in a plate or a bowl. Next add 2 tbsp of ghee in the wok and heat it on medium heat. 4. Now add one piece of edible gum and check whehther it puffs up slowly and gets cooked properly. If it sizzles for a while and puffs up slowly ,the ghee is ready. 5. Add the remaining gond pieces and fry them on low to medium heat such that they puff up slowly to big rounds and change color after 2 mins. Once they are done on all sides and nicely swollen, take them out in a plate. Similarly fry all the gond and keep it aside for the the laddu. 6. 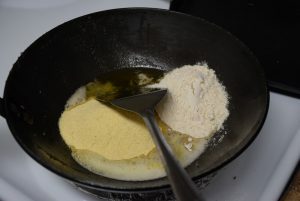 Next in the same wok, add 3/4 cup ghee and add besan and atta to it. Turn on the heat and stir the mixture. 7. 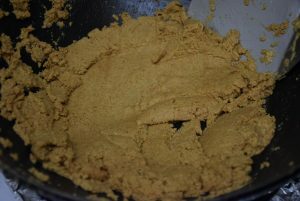 Keep on stirring the mixture till everything is mixed on medium heat. 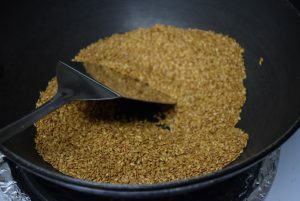 In the meanwhile, you may grind the cooled flaxseeds to a powder form. Try to make it as fine as possible. Transfer it to a plate. 8. Continue roasting the flours till they smell aromatic and change color. 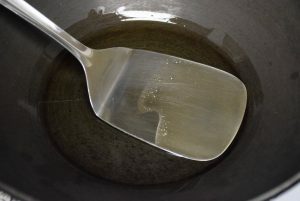 Also you will see that they would ooze out ghee no longer stick to the wok. This would take 12 to 15 mins. 9. 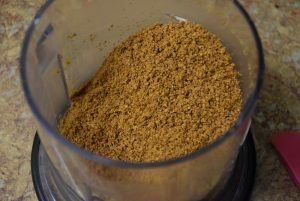 Once the flours are done, add the ground flaxseed powder to it and keep on stirring till everything is mixed. Transfer the contents in a parat(tureen) or a big bowl. Crush the puffed up gond with a rolling pin in the plate or crush it with the back of a spoon or a steel glass. 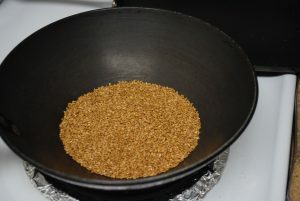 If the Gond is fried right, it will turn in to powder easily. 10. 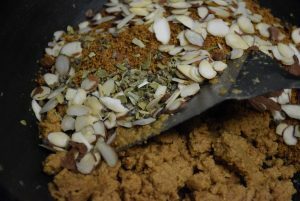 Add the ground cardamom, almonds and gond to the flour-alsi-ghee mixture and mix them well. 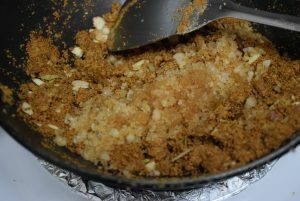 Toss it for 5 mins and then add the Bura(Indian unrefined sugar) or granulated sugar to it. 11. Mix everything and start shaping them into roundels by rolling between your palm and fingers while the mixture is still warm. Store in air-tight containers and enjoy till they last! 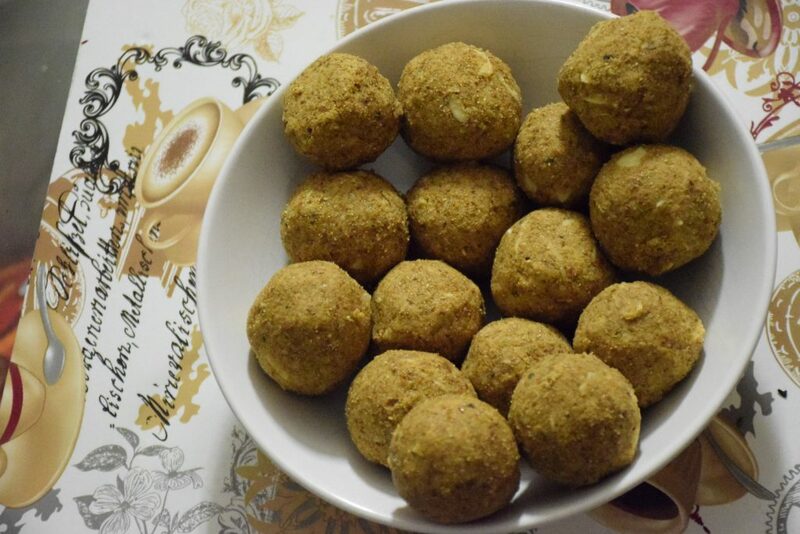 Taste and health combined in one flavor, these laddoos are a sure winter delight! As the sun shifts into "Uttarayan" (the Northern journey) today, I start with a healthy note of "Alsi ke laddu". 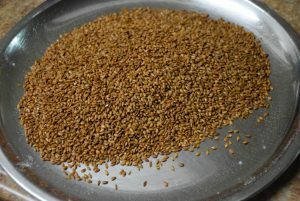 Flaxseeds (Alsi) are not only good in Omega-3 but also in lignans and fiber content. So starting this year with the wish of health and peace for everyone, I bring to you an easy recipe of these laddus. 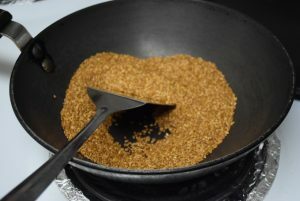 Take a wok, and add the Alsi seeds (flax seeds) to it. Dry roast them on medium heat for 4 to 5 mins. 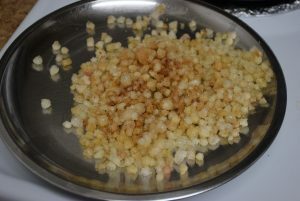 After a few mins, they will start crackling or popping like the mustard seeds (rai) and sputter . Stir them continously and lower the heat. You will notice they had puffed up little in size. Take them off the heat and transfer them in a plate or a bowl. Next add 2 tbsp of ghee in the wok and heat it on medium heat. Now add one piece of edible gum and check whehther it puffs up slowly and gets cooked properly. If it sizzles for a while and puffs up slowly ,the ghee is ready. 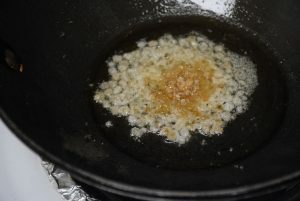 Add the remaining gond pieces and fry them on low to medium heat such that they puff up slowly to big rounds and change color after 2 mins. Once they are done on all sides and nicely swollen, take them out in a plate. Similarly fry all the gond and keep it aside for the the laddu. 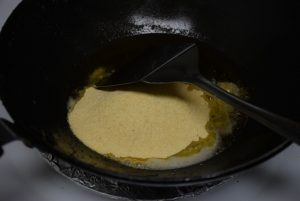 Next in the same wok, add 3/4 cup ghee and add besan and atta to it. Turn on the heat and stir the mixture. Keep on stirring the mixture till everything is mixed on medium heat. 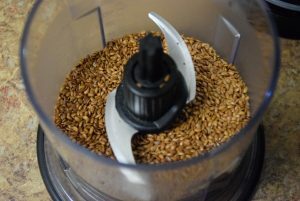 In the meanwhile, you may grind the cooled flaxseeds to a powder form. Try to make it as fine as possible. Transfer it to a plate. Continue roasting the flours till they smell aromatic and change color. 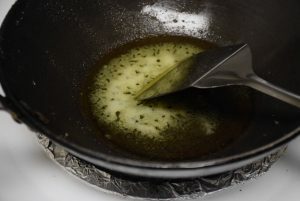 Also you will see that they would ooze out ghee no longer stick to the wok. This would take 12 to 15 mins. 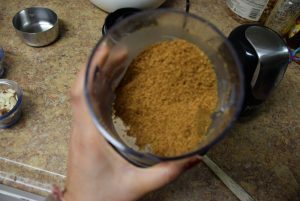 Once the flours are done, add the ground flaxseed powder to it and keep on stirring till everything is mixed. Transfer the contents in a parat(tureen) or a big bowl. Crush the puffed up gond with a rolling pin in the plate or crush it with the back of a spoon or a steel glass. 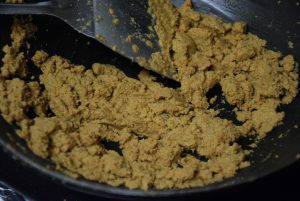 If the Gond is fried right, it will turn in to powder easily. 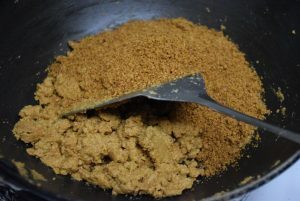 Add the ground cardamom, almonds and gond to the flour-alsi-ghee mixture and mix them well. 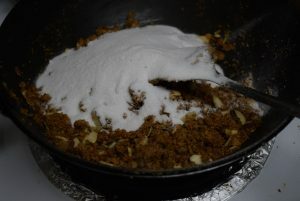 Toss it for 5 mins and then add the Bura(Indian unrefined sugar) or granulated sugar to it. Mix everything and start shaping them into roundels by rolling between your palm and fingers while the mixture is still warm. 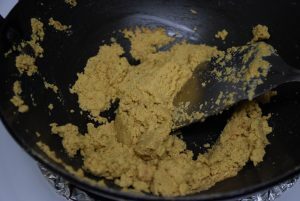 This entry was posted in Desserts, Food, Recipes and tagged Alsi, atta, besan, bhura, bura, Carenshare, Chickpeas flour, clarified butter, desi ghee, Dink, Fiber, flaxseeds, Gond, gram flour, granulated sugar, gum, Indian sweet, laadu, laddoo, laddu, ladu, Lignans, Muscle wear and tear, North-Indian, Omega-3, recovery for nursing mothers, shweta jindal, Strength to bones and ligaments, tagar, Tissues repair, whole wheat, Winter recipe, zindagisikhati.